Age related macula degeneration (ARMD) is the leading cause of blindness for people over the age of 50 in the developed world. It is set to become a major problem as the population of the developed world ages over the coming decades. In simple terms, macula degeneration is the breaking down of the macula over time resulting in loss of central vision. The macula is the specialised, central part of the retina and is responsible for the sharp central vision we need to do tasks such as reading and driving. Macula degeneration typically causes distortion and blind spots directly in the middle of your field of vision. It has no effect on side vision. When a diagnosis of Macula degeneration is made, it is classified as either wet or dry. A wet diagnosis is known as neovascular degeneration. The term neovascular refers to new blood vessel growth in a specific area, like the macula, in which there should not be any new growth. Under the retina, new blood vessels start to grow in order to supply more oxygen and nutrients to the central retina as they age. However, new blood vessels leak fluid and blood. When this happens, the leaking will cause permanent and irreversible damage to the light sensitive retinal cells and they will die off, creating central vision blind spots. Dry Macula degeneration is more common than wet Macula degeneration. Approximately 90% of patients are initially diagnosed with dry ARMD. Dry ARMD is often thought of as the initial phase of ARMD. 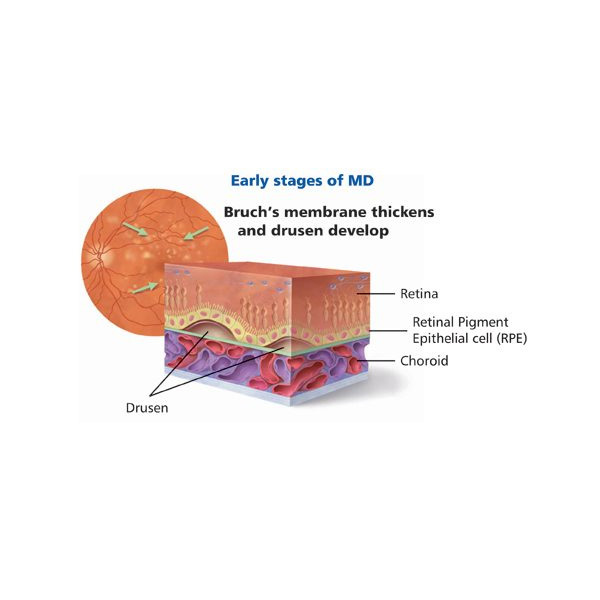 It is caused by the thinning and aging of the macula tissues, characterised by the accumulation of yellow spots called drusen in and around the macula area. These spots are debris, or deposits, from the deteriorating tissues. Slow central vision loss can occur with dry ARMD, but it is generally slower and not as serious as that experienced with wet ARMD. Optometrists can detect the early signs of ARMD before any typical symptoms present themselves. This is usually done by examining the retina with an ophthalmoscope. When ARMD is suspected, a short test using an Amsler grid to measure the central vision is done. An Amsler grid, is a chart full of blackened lines in the pattern of a grid. Instead of appearing as a perfect grid, when viewed by someone with ARMD they appear distorted or wavy. Your optometrist will likely also take a scan of your maculas with a camera-like instrument called an Ocular Coherence Tomographer. The OCT creates an image of your macula like an x-ray and is a very accurate way of determining if you have ARMD, what type and how severe it is. Despite significant improvements in the treatment and management of Macula degeneration, a total recovery of lost vision even with treatment is not likely.